SPRINGFIELD – Illinois House Republican Leader Jim Durkin (R-Western Springs) along with all members of the House Republican Caucus have filed a resolution demanding an independent redistricting reform solution. House Resolution 995 shows broad support for maps to be drawn without regard to incumbency and partisanship, and allows voters the opportunity to choose a candidate based on the issues and policies most important to them. Legislative district maps are redrawn every ten years based on the newest census results. 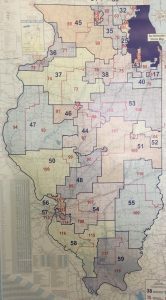 According to a poll from the Paul Simon Public Policy Institute, 72 percent of Illinois residents, including a majority of both Republicans and Democrats, support the creation of an independent commission to draw legislative district maps. Based on the current legislative calendar, the deadlines for passage are April 27 in the House and May 3 in the Senate.